The fossil fuel industry is a larger contributor to atmospheric methane levels than previously thought, according to our research which shows that natural seepage of this potent greenhouse gas from oil and gas reservoirs is more modest than had been assumed. In our research, published in Nature today, our international team studied Antarctic ice dating back to the last time the planet warmed rapidly, roughly 11,000 years ago. 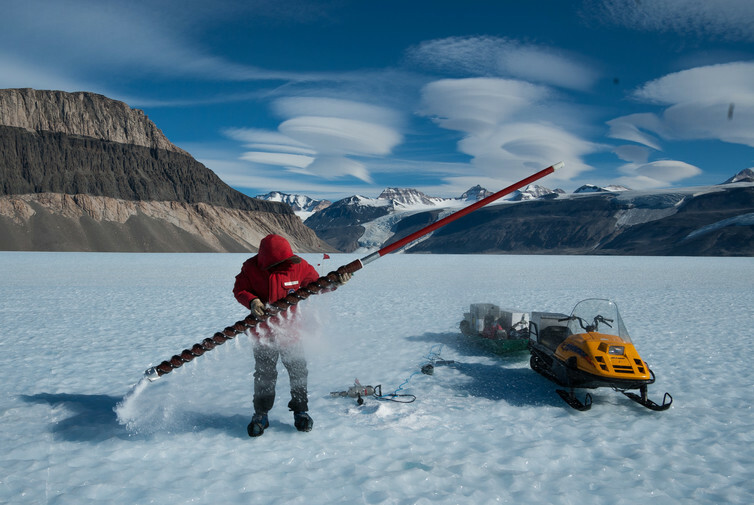 ice coring work at Taylor Glacier in Antarctica. We found that natural seepage of methane from oil and gas fields is much lower than anticipated, implying that leakage caused by fossil fuel extraction has a larger role in today’s emissions of this greenhouse gas. However, we also found that vast stores of methane in permafrost and undersea gas hydrates did not release large amounts of their contents during the rapid warming at the end of the most recent ice age, relieving fears of a catastrophic methane release in response to the current warming. Methane levels started to increase with the industrial revolution and are now 2.5 times higher than they ever were naturally. They have caused one-third of the observed increase in global average temperatures relative to pre-industrial times. If we are to reduce methane emissions, we need to understand where it comes from. Quantifying different sources is notoriously tricky, but it is especially hard when natural and human-driven emissions happen at the same time, through similar processes. The most important of these cases is natural methane seepage from oil and gas fields, also known as geologic emissions, which often occurs alongside leakage from production wells and pipelines. The total is reasonably well known, but where is the split between natural and industrial? To make matters worse, human-caused climate change could destabilise permafrost or ice-like sediments called gas hydrates (or clathrates), both of which have the potential to release more methane than any human activity and reinforce climate change. This scenario has been hypothesised for past warming events (the “clathrate gun”) and for future runaway climate change (the so-called “Arctic methane bomb”). But how likely are these events? To find answers, we needed a time capsule. This is provided by tiny air bubbles enclosed in polar ice, which preserve ancient atmospheres. By using radiocarbon (14C) dating to determine the age of methane from the end of the last ice age, we can work out how much methane comes from contemporary processes, like wetland production, and how much is from previously stored methane. During the time the methane is stored in permafrost, sediments or gas fields, the 14C decays away so that these sources emit methane that is radiocarbon-free. In the absence of strong environmental change and industrial fossil fuel production, all radiocarbon-free methane in samples from, say, 12,000 years ago will be from geologic emissions. From that baseline, we can then see if additional radiocarbon-free methane is released from permafrost or hydrates during rapid warming, which occurred around 11,500 years ago while methane levels shot up. The problem is that there is not much air in an ice sample, very little methane in that air, and a tiny fraction of that methane contains a radiocarbon (14C) atom. 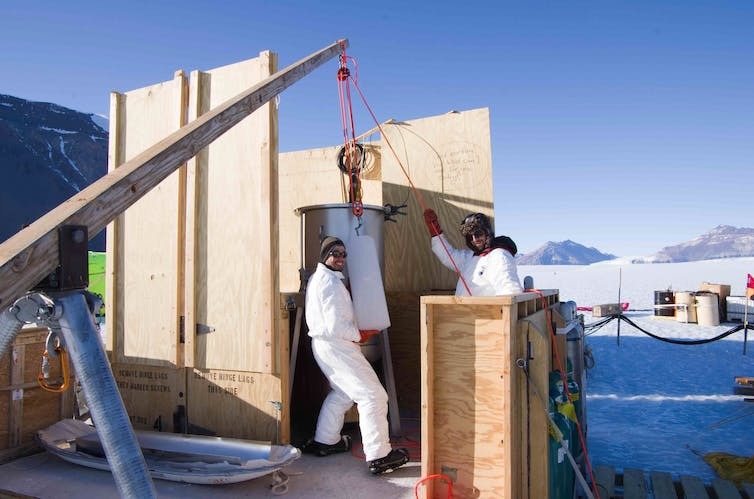 There is no hope of doing the measurements on traditional ice cores. Our team therefore went to Taylor Glacier, in the Dry Valleys of Antarctica. Here, topography, glacier flow and wind force ancient ice layers to the surface. 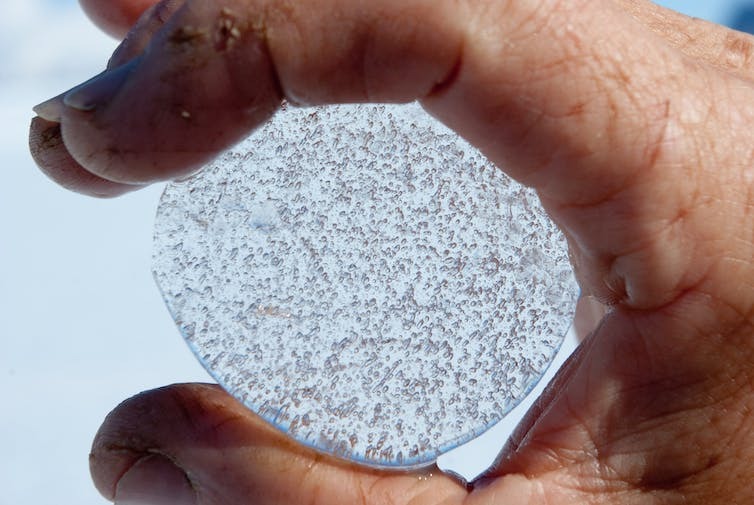 This provides virtually unlimited sample material that spans the end of the last ice age. 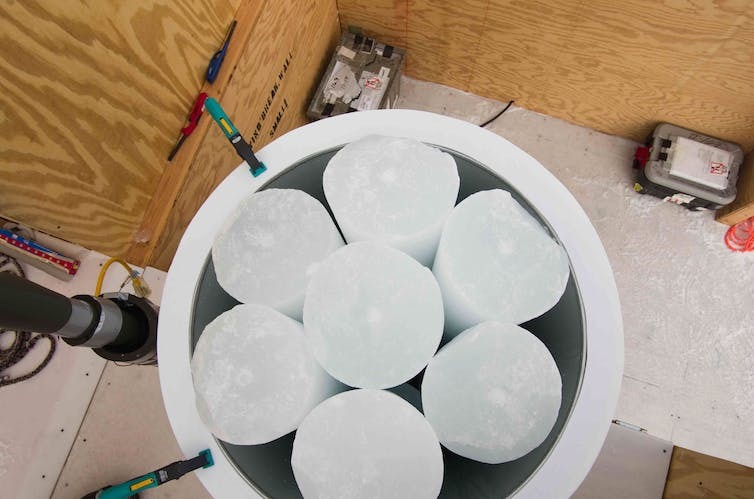 For a single measurement, we drilled a tonne of ice (equivalent to a cube with one-metre sides) and melted it in the field to liberate the enclosed air. From the gas-tight melter, the air was transferred to vacuum flasks and shipped to New Zealand. In the laboratory, we extracted the pure methane out of these 100-litre air samples, to obtain a volume the size of a water drop. Only every trillionth of the methane molecules contains a 14C atom. Our collaborators in Australia were able to measure exactly how big that minute fraction is in each sample and if it changed during the studied period. Because radiocarbon decays at a known rate, the amount of 14C gives a radiocarbon age. In all our samples the radiocarbon date was consistent with the sample age. Radiocarbon-free methane emissions did not increase the radiocarbon age. They must have been very low in pre-industrial times, even during a rapid warming event. The latter indicates that there was no clathrate gun or Arctic methane bomb going off. So, while today’s conditions differ from the ice-covered world 12,000 years ago, our findings implicate that permafrost and gas hydrates are not too likely to release large amounts of methane in future warming. That is good news. Wetlands must have been responsible for the increase in methane at the end of the ice age. They have a lesser capacity for emissions than the immense permafrost and clathrate stores. Geologic emissions are likely to be lower today than in the ice age, partly because we have since drained shallow gas fields that are most prone to natural seepage. Yet, our highest estimates are only about half of the lower margin estimated for today. The total assessment (natural plus industrial) for fossil-fuel methane emissions has recently been increased. In addition, we now find that a larger part of that must come from industrial activities, raising the latter to one third of all methane sources globally. For comparison, the last IPCC report put them at 17%. Measurements in modern air suggest that the rise in methane levels over the last years is dominated by agricultural emissions, which must therefore be mitigated. Our new research shows that the impact of fossil fuel use on the historic methane rise is larger than assumed. In order to mitigate climate change, methane emissions from oil, gas and coal production must be cut sharply. Feature image: The analysis of large amounts of ice from Antarctica’s Taylor Valley has helped scientists to tease apart the natural and human-made sources of the potent greenhouse gas methane.